Apply here for the Chase Sapphire Preferred credit card. 3 What would I use the 55,000 Ultimate Rewards bonus points for? 9 How can I complete the minimum spend? 10 What if my application was denied? The Chase Sapphire Preferred card is one of the slickest cards to actually hold in your hands, as it’s made of metal and is virtually indestructible. My rental car got damaged last year and the insurance paid out, with no deductible. I lost a Fitbit a few years ago and I received a check just a few days later. I got a cash emergency PIN set easily after my backpack was stolen in Uganda. If your application is successful, you get 55,000 Ultimate Rewards! – You get 50,000 Ultimate Rewards points just for signing up and completing a minimum spend of $4,000 in the first 3 months of account opening. What would I use the 55,000 Ultimate Rewards bonus points for? Singapore Airlines KrisFlyer is a 1:1 transfer partner of Ultimate Rewards. It’s worth repeating that Singapore Airlines has a fantastic first and business class product and flights on Singapore Airlines are rather easy to book with KrisFlyer miles. Frankfurt and Tokyo are served by the A380, which has a phenomenal Singapore Airlines First Class product. Fuel surcharges are modest and lowest on routes departing to or from Hong Kong as well as from Brazil. The redemption rates vary, but start at ~50,000 per one-way. Once you complete your minimum spend and add an authorized user, you will have enough points needed for the Park Hyatt in the Maldives. 25,000 points per night replaces a cash payment of $1,080 plus taxes and fees! 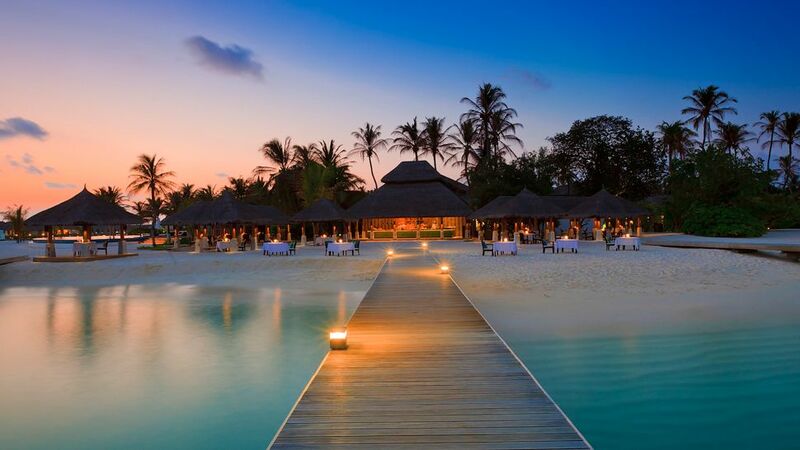 This Park Hyatt is located on a private island, one hour south of Male Airport. It looks breathtaking and also prides itself on many favorable reviews. Keep in mind that food prices are high and the transfer from the airport will be billed extra. This works best if you already have a flight to Southeast Asia and want to make the return over the Pacific a bit more ‘creative’. Transfer 45,000 points to United MileagePlus and you can fly on Singapore Airlines and Air New Zealand from anywhere in Southeast Asia to Tahiti. united.com will not show Singapore Airlines flights, but most flights are bookable when you call, so call United reservations directly. Note that Air New Zealand availability is very limited. I recently went to French Polynesia and loved Bora Bora Island and the InterContinental Le Moana. While not my favorite airline, others have had great experiences. Korean Air SKYPASS is a 1:1 Ultimate Rewards transfer partner. Korean Air Business Class from Brazil to Los Angeles is just 52,500 miles and no fuel surcharges (although they apply in the other direction). As usual, look up availability first (I use ExpertFlyer for Korean Air) and call to double-check it’s bookable before you make any transfers. Other great options include flights in Micronesia with United/Star Alliance, 4 nights at the Marriott Jakarta or a whirlwind economy round-trip through Europe from the Azores to Greece via Norway; these are just 30,000 United MileagePlus miles each. Another option is one of the many Marriott Rewards Category 1-3 properties that are bookable at 7,500 to 15,000 points a night, especially in Southern Africa; this can be a steal! Put all your regular spend on it and read our guide to manufactured spending. $4,000 in 3 months should be really easy!